Minnesota lawmakers are considering additional new taxes and fees to electric vehicle (EV) owners. If passed as written, Minnesota would have the highest EV tax in the nation. Currently the state assesses a special $75 annual tax that is only paid by owners of fully-electric vehicles. A bill by Senator Jeff Howe proposes to raise this tax to $250 per year and add a new tax of $125 for hybrid vehicles. These taxes are unfair, ineffective, and bad public policy for Minnesota. Here are some of the reasons. EV owners already pay their fair share. Some people accuse EV owners of “not paying their fair share” for roads because they do not pay a gas tax. In reality, gas taxes are just one of three funding sources for the Highway User Tax Distribution Fund (HUTDF), which is used to pay for maintaining state roads, representing about a third of revenues for highway maintenance. The other two-thirds of the funding come from the Motor Vehicle Sales Tax (paid when you purchase a vehicle), registration fees paid annually, and a few other sources. Today, EVs tend to cost more up front, yet they offer greater savings over the life of the vehicle. Because EVs have a higher upfront cost, and sales tax and registration fees are based on the value of the vehicle, EV owners pay more of these taxes than equivalent conventional vehicle owners. So despite not paying gas tax, EV owners tend to contribute more to the highway trust fund than conventional vehicle owners. On top of that, they are assessed a special EV tax already, which exacerbates the over-taxation of EVs. Figure 1 illustrates how fees result in over-taxation of EVs. For example, a Nissan Leaf (EV) owner would already pay $4,475 over fifteen years compared with $3,154 for the nearly equivalent Nissan Versa (non-EV) owner, including sales tax, registration fees, gas tax, and the existing special EV tax of $75. Adding in the proposed $250 EV tax, the EV owner would pay $5,071 more over fifteen years. Comparing the Chevy Bolt with the Chevy Malibu today gives similar results – the Bolt owner pays $2,413 more today and would pay $6,163 more if the proposed bill passes. Our analysis demonstrates that EV owners already pay more than their fair share. In fact, a fair EV tax policy that accurately reflects what EV-owning taxpayers are already contributing would be a tax refund. Figure 1: Electric vehicle owners pay more per year than comparable vehicle owners in registration tax and motor vehicle sales tax. This more than makes up for the motor fuel tax that they do not pay. 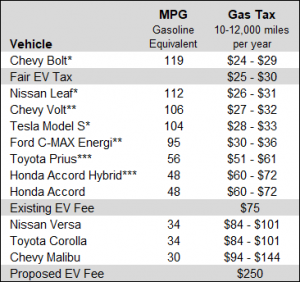 EV taxes are inconsistent with the “user-pays” principle underlying the gas tax. Gas taxes are classic user fees–if you drive more and use the roads more, you pay more. A special EV tax does not follow this principle. Let’s imagine two people–a retired school teacher on a fixed income who buys a used Nissan Leaf for trips around town and puts on 5,000 miles per year and a Lyft driver who puts 40,000 miles per year on their Chevy Bolt. Under the proposed bill, both drivers would pay $250 per year regardless of how much they use the roads. That wouldn’t be true if they both drove a gas car. Furthermore, a gas tax rewards fuel efficiency. Vehicle owners that are more fuel-efficient pay less per mile driven than less fuel-efficient vehicles. Whether that accurately reflects their impact on roads is debatable. What’s not debatable is that it is unfair to single out EV owners for special taxes and not do the same for owners of other fuel-efficient vehicles. If we ignored that EV owners are already paying more in sales tax and registration fees and tried to assess a user fee to EVs based on their fuel efficiency, figure 2 illustrates the result. Because the U.S. Environmental Protection Agency (EPA) publishes gasoline equivalent miles per gallon for EVs, we can compare what an EV owner should pay with what a gasoline vehicle owner pays if the vehicles are driven the same distance–in this case from 10,000 to 12,000 miles per year. In this scenario, a fair EV tax would be closer to $25-30 per year, compared with the much higher existing tax of $75, and the much, much higher proposed tax of $250. Yet given higher overall sales taxes and registration fees paid by EV owners, even this approach leads to over-taxing EV owners. Figure 2: Gasoline car motor fuel taxes are determined by the MPG of the car, with higher MPG cars paying less annual motor fuel tax. The EPA assigns MPG-equivalent ratings to EVs in the 100-120 MPG range, compared to 30-35 MPG for a gasoline car and 40-45 MPG for a hybrid car. A fair EV motor fuel tax offset would be calculated based on MPG and would be $25-30/year, not $250/year as has been proposed. Since the end of 2017, there were just under 7,000 EVs registered in Minnesota. With the existing $75-dollar tax, Minnesota collects $525,000. With a $250 tax, the state would collect $1,750,000 from EVs. The Highway User Tax Distribution Fund (HUTDF) is $2.26 billion dollars, collected from 7.4 million vehicles. Gas tax revenues have been declining in the state, but it’s due to the increasing fuel efficiency of gasoline and diesel vehicles. As our analysis demonstrates–increased EV sales would enhance the HUTDF. As battery costs decline, the up-front cost of EVs decline as well. Bloomberg New Energy Finance projects that between 2025 and 2030, EVs will have the same, or lower, up-front cost as conventional vehicles. At that point, EV owners will not pay more in sales tax and tab fees, and an EV assessment will be appropriate. The tax policy applied should be fair–it should tax EVs equivalent to a conventional vehicle with the same fuel efficiency and it shouldn’t over-tax EV owners who drive few miles per year. And most importantly, we shouldn’t add extra EV taxes today when EV owners are already paying more. What about all those EV subsidies? EV owners are eligible to receive a federal tax credit, which is beginning to phase out for some EV manufacturers. But this is not relevant to the Minnesota highway funding conversation because the EV tax credit is not paid from Minnesota highway funds. Minnesota should be promoting EV technology, not discouraging it with putative taxes. As laid out in the recent release of “Accelerating Electric Vehicle Adoption: A Vision for Minnesota,” published by the Minnesota Department of Transportation, Minnesota Pollution Control Agency, and the Great Plains Institute. This vision shows that EVs offer the state numerous benefits including cleaner air for vulnerable populations. Drive Electric Minnesota strongly believes that Minnesota has an opportunity to be a leader in increasing EV adoption and will support policies to encourage that. Stay tuned for details!